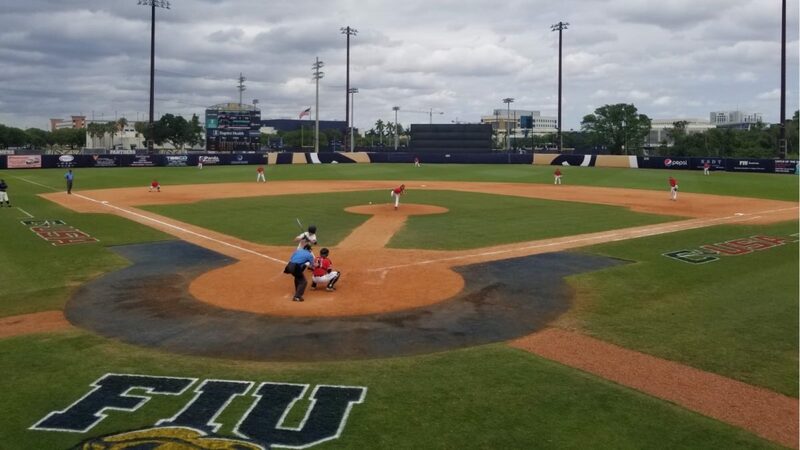 Miami, FL – The Western Kentucky Hilltoppers brought out some serious lumber, absolutely obliterating the FIU Panthers with three homers en route to a 15-1 drubbing Sunday afternoon at FIU Baseball Stadium. The Mercy Rule shortened rubber match between the C-USA rivals was anything but as Christian Santana (1-1, 4.79 ERA) had an abysmal outing, lasting four innings. WKU’s Reece Calvert (0-2, 5.40 ERA) had copious amounts of run support to nail down his first win of the year. Western Kentucky jumped ahead with a solo shot to left by Davis Sims. It was a preview of the enormous pain to come. Jake Sanford hit nibbler to the pitcher, but Santana handed it a little too quickly, making a wild throw to first. Sanford made it all the way to second on the error. He advanced to third on a wild pitch by the shaky Santana and eventually scored on a groundout to second. It wouldn’t be the last we’d hear of him. FIU got one back in the home half of the first with an RBI single from Lorenzo Hampton Jr. The Panthers had a golden opportunity when Javier Valdes drew a walk to load the bases but John Rodriguez flew out to end the inning. Bottom 1 | Panthers cut the lead to 1 with a Hampton RBI single. Sanford and the Hilltoppers struck again with another dinger the following frame. The hit skirted the foul pole in left as the wind carried it significantly, almost turning it into a foul ball. Sanford’s three-run blast put the visitors in a commanding 5-1 lead. The Panther Killer took Santana deep for a second time with another three-run shot, this one in the fourth, turning the game into an ugly rout from there on out. Prior to the game, the junior from Nova Scotia was having a miserable weekend. He was 1-for-7 with 6 strikeouts. Talk about a dramatic turnaround. The right-fielder capped off a terrific day, going 3-for-5 with 2 HRs, 7 RBIs, 5 Runs and a double. Heading into the weekend series, Florida International had won six straight meetings and nine of their last twelve against Western Kentucky. The blue and gold went as far as adding to the streak with a 2-1 win Friday night but the dominance had come to an abrupt halt with WKU mounting a three-run rally in the ninth to even the series Saturday night, 5-4. With the (Terrible) loss, FIU falls to 11-12 (2-4 C-USA). The Hilltoppers improve to 11-11, (5-1 C-USA). Looking ahead, the Panthers prepare for a home and home mid-week series against Florida Gulf Coast. And the mercy rule has been applied. Ballgame. Western Kentucky ended the day scoring 15 runs on 16 hits. No errors. FIU limped away scoring 1 run on 4 hits committing 3 errors. Lorenzo Hampton Jr. was the lone bright spot going 2-for-2 with the lone RBI. The Panthers still lead the all-time series 36-34. During the game WKU left 8 runners on base, FIU stranded 3. Christian Santana frustrated the FIU faithful, lasting four innings coughing up eight runs (seven earned) on eight hits, walking two. The long ball haunted him all game.